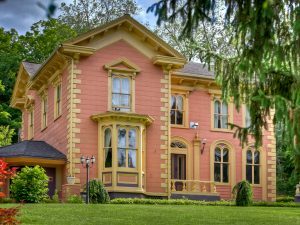 This romantic home and estate was completed in 1850. Named for its original owner, The Alexander Arnold House, later called Fenwood Manor, it is painted wood construction imitating stone work, with raised corner quoins edging the building. The porch columns’ tapered squares and the scroll-carved wood ornaments edging the windows and under the roofs, reflect the remarkably graceful shapes of the period. Deep triangular pediments and flat pieces over the windows are reminiscent of 17th Century Palladian palaces in Italy. The interior with its gesso frieze and wood-carved decorative touches echo that romantic architecture. The entire skeleton of the main house comprises huge, hand-adzed and shaped hardwood beams and sills which enclose each room. These are mortised together with massive deep tongues and pinned with large hand-carved wooden pins which can be clearly viewed in the cellar and attic. A glass cupola ventilator with a copper roof and tilting side panels crowns the roof and ventilates the attic, and four long, wide gables extend from the flat section of the roof like a huge pinwheel. 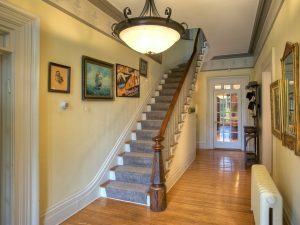 The centerpiece of the home is a 19-step main stairway made of thick pieces of native pine, with black walnut balusters. The newel post is flame-grain hard black walnut and is anchored through the thick flooring into the cellar. Carved Vitruvian Scrolls decorate the risers, and the tall stairway itself has a graceful, elegant curve made by the lost art of shaping so-called unsupported steps that cling to the wall at the top of the stairs. Just at the curve is a plaster and marble statuary niche, typical of the period. Several rooms still retain the original wide-plank and painted floors, fine ceiling plasterwork above the chandeliers, and deep-cove hard plaster cornice moldings that border the 12 feet ceiling. Of special interest is the important, beautifully carved wood and gesso fireplace mantelpiece in the Drawing Room. 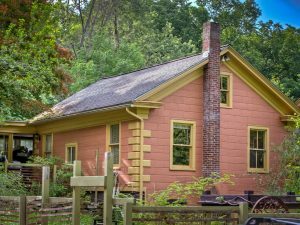 It was added to the home in 1959 but originates from the late 18th Century, designed and made by Samuel McIntyre of Salem, Mass around 1780-90. Purely decorative, it has a wonderful, large center panel featuring Venus with gold cherubs, and the supporting columns feature gorgeous scrolls, leaves and raised round beads. An amazing piece of art work! 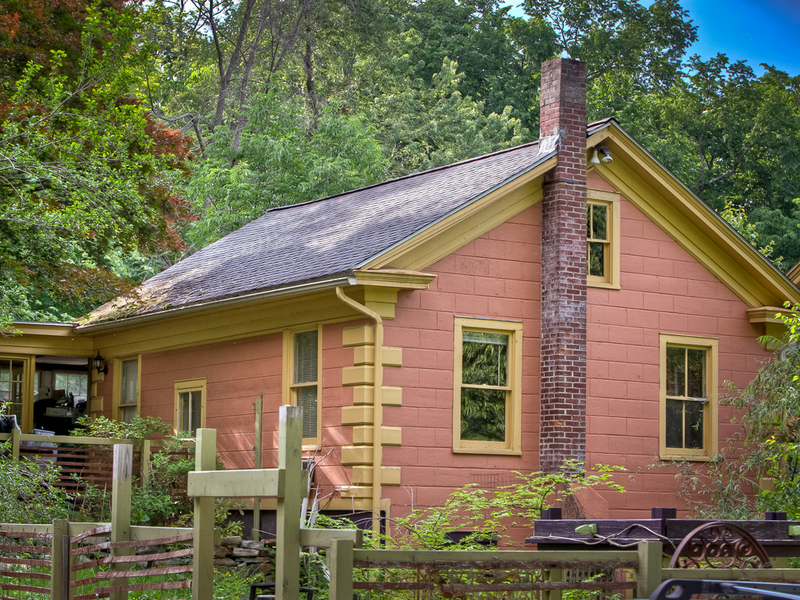 The caretaker’s house was built in 1890, has 2 bedrooms with a full bath, and nestles comfortably behind the main house, with its own cottage garden and pond. It is rented out by the current owner and the income from the tenant covers all real estate and school taxes.